The ramifications of hiring the wrong person can be perilously expensive for a company of any size. The U.S. Department of Labor estimates the cost of a bad hire can set your company back as much as 30 percent of the worker’s yearly earnings. Additionally, it turns out 75 percent of demand for new workers is just to account for employee turnover. Using company goals as early as your requisition process is the best way to find talented candidates who will add real value. If recruiters, hiring managers and employees all clearly understand what the new hire will be expected to achieve, the chances of letting a bad hire slip through the cracks are greatly reduced. Everything in the hiring process should have an emphasis on your company goals. Before you use your recruiting software to wade through applications or promote your open positions, you need to truly understand your company's strategic objectives. Understanding goals makes it easier for you to see how your new hire will contribute value and allow you to tailor your recruiting plan accordingly. 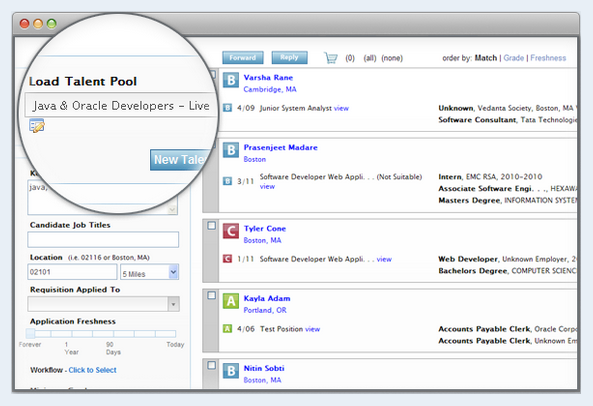 By using goals to create keywords that can be used by your recruiting software to filter candidates, you can start to curate talent pools based on what candidates will be expected to accomplish. Approaching the process from a goal-based perspective ensures new hires are aligned with your company's large-scale plans before they ever set foot in the office. Once you understand how the new hire should contribute in their role, it’s time to write specific, targeted job descriptions that you can leverage within your software. Good job descriptions can help candidates better self-select what jobs they apply for because you've provided highly specific information. They'll also help you create a more efficient onboarding process once you've made a great hire, since the employee already has a good idea of their place in the company hierarchy and the workflow towards goals. Since these descriptions also contain keywords you’ll use to organize and evaluate candidates in your recruiting software, think critically before writing. Let the candidate know exactly what skills they'll need and how their position will impact company workflow and progress. You invested in recruiting software for a reason, and you should be using it as effectively as possible in order to hire smarter. Trust your recruiting software to do all the heavy lifting like resume grading, maintaining a talent pipeline, and communication, so you can focus your efforts on connecting with the best people. When you know what goals they’ll need to accomplish on the job, you can have a clearer idea of what kind of candidates will be able to add real value. Once you connect personally with the best candidates, you should use the interview process to ensure they truly understand the role and how their unique talents can contribute. This way you end up with new hires excited to hit the ground running and immediately understanding why their new role matters. Leveraging your software to assist you in finding the perfect candidates who will help drive company strategy and progress will improve your applicant tracking, shorten time spent onboarding, and ensure you hire the right person every time. What do you think? How do you use goals to improve hiring? Share in the comments!